What does a critical look at the workings of gentrification teach us about our right to resist it? We live in an era where claims are commonly made, and largely accepted, that the U.S. has made such significant and irrefutable progress from its past of racial struggle that it has essentially overcome it. The presence of oppressed bodies in advertising, as TV show characters, in government and other highly visible venues is often used to support these claims. On the one hand, our identities as queer, Brown, disabled, and immigrant individuals are given hyper attention when they are needed to illustrate diversity or prove the progressiveness of traditionally conservative institutions. On the other, our needs are ignored and openly attacked by those same institutions as they appropriate our bodies to mask their indifference to the healthy and dignified survival of our people. Across the board, we are expected to believe that our oppression no longer exists, fed such myths by the exact sources who benefit most from our continued marginalization. In my experience, there is no place in which this reality is more apparent and less examined than the gentrification of oppressed neighborhoods, and the forcible removing of their populations. There are many reasons I feel gentrification is a taboo subject. It is an act which people of every identity sometimes feel compelled to participate in out of economic necessity, even when it causes political and social discomfort. It is often understood to be inevitable, both on the part of communities who experience it and those who initiate it, and though it is a regular subject of ironic humor, it is less often treated as one for political engagement and resistance. It forces many of us to examine the ways in which our political rhetoric does not match up with our daily realities. Yet above all else, the reason I feel gentrification continues to be largely avoided as an topic is that it pulls the rug out from under every myth of post-racial progress, and forces us to examine how our world continues to depend not merely on racial segregation, but economic, geographic, linguistic, and so many more. Moreover, its examination shows how these factors work in unison to preserve dominating structures, and empower the privileged over the oppressed. I recently read a report published by associate professor John Betancur from the University of Illinois titled Gentrification Before Gentrification? which documents the struggle of the Mexican/Xican@ community in the Chicago neighborhood of Pilsen in its resistance of economic abuse by outside interests. The report’s conclusion makes several significant claims that are rarely described in relation to changing neighborhoods: 1. That it was not small scale opportunism on the part of individuals seeking cheap rent prices, but the greed of powerful institutions—like those of the nearby business district and the University of Illinois itself—working systemically to secure their interests in the neighborhood which spurred its gentrification. 2. Community organizations and their leaders joined forces to actively resist gentrification, and learning from past struggles rallied local government, activists and youth programs to use art, protest and housing networks to stave off the appropriation of real estate by outside forces, and were largely successful. 3. Gentrification of the neighborhood began to take off not because outside forces broke through community efforts, but because middle class members of the community infiltrated local organizations and used a post-race ideology to undermine those efforts. Claiming that organizers who framed the struggle of the working class Mexican/Xican@ hood as one against wealthy white outsiders were imagining dynamics which no longer existed, middle class members of the community were able to slow the efforts of organizers, and pave the way for their own potential benefiting from Pilsen’s gentrification. Another Chicago neighborhood which has been experiencing rapid demographic shifts in recent years is the historically Boricua hood of Humboldt Park, whose anti-gentrification struggles are also informed by those of Pilsen. The report on Pilsen notes that one of the key means of resistance used by local organizers was community-generated art. The 18th St. stop on the pink line, for example, has been covered by murals and graffiti, much of them featuring Indigenous-inspired symbols and images. What was intended to rally community and aggressively mark territory, however, was turned into a selling point by real estate agents and middle class community members. The symbols that were meant to galvanize pride in local heritage were appropriated as signals of authenticity and exoticness to outsiders. 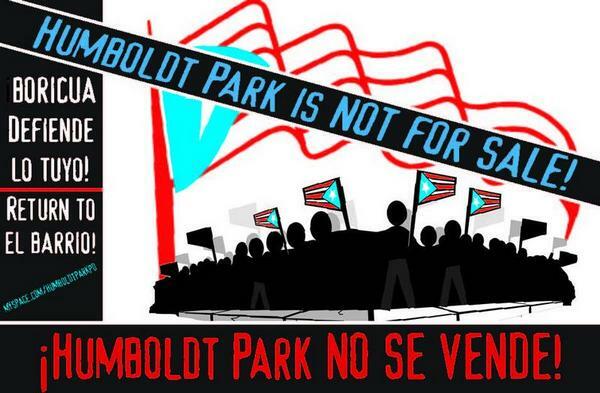 In a similar vein, Humboldt Park, whose main drag is bookended by two steel sculptures of the Puerto Rican flag, has already become a hotspot for young privileged Chicago residents, and is commonly marketed as a “real” and “authentic” neighborhood, prized more for great food than its radical social and political history. All of these accounts point to gentrification as a key site in which the racial and economic access of certain groups are relied on to force resources away from others within the bounds of their own communities, often under the guise of diversity and racial harmony. I believe this understanding should teach us not merely that racism persists as an issue in our national culture—one that is inevitably tied to a host of other systems of oppression—but that it is the very ways in which we attempt to denounce or deny its gravity that allow it to gain deeper footholds. When we think of gentrification as the unavoidable demographic shifts that occur out of economic need, and not a tool for powerful interests to appropriate and control the resources of oppressed communities; When we imagine it as an option for making our neighborhoods safer, rather than a means of banishing the social issues that we have yet to address in just and self-determined ways; When we look at our own hoods in terms of location and economics, and forget that they are communities whose knowledge we need, and in which we can choose to involve ourselves, we undermine the wellbeing of our people, and support the disenfranchisement of untold others. How do we continue to resist gentrification, and unite across communities to defend all of our autonomy? How do we strengthen ourselves when power claims we no longer require strengthening? How can we demonstrate that our local struggles are not isolated conflicts amongst individuals, but rooted in larger systems of inequity? ← Teaching for Social Justice Curriculum Fair This Saturday! Thank you for your thoughts and the link, this seems like a very useful and challenging idea being presented.